Get a 100% up to $100 Bonus on your first Deposit! 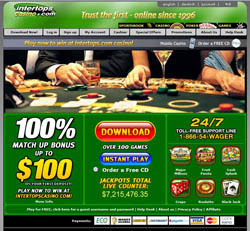 InterTops Casino provides daily and weekly promotions for regular players with new players receiving a 100% match bonus up to $100 FREE on their first deposit at the casino. This bonus is an instant match, which means once you have deposited to the casino, your account will be credited with the match bonus within 12 hours of making your deposit. You will be able to use this bonus just like your own funds and play with it as soon as it hits your account. 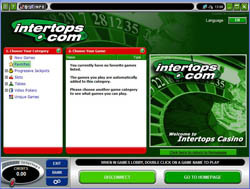 Players can access InterTops Casino using their mobiles, and as a special promotion the casino is giving away instant cash bonuses to players who play at InterTops via their mobiles. Each Sunday the casino will randomly select the winners who will then receive anywhere from $5 up to $100 free. Fantasy Golf is a unique promotion at InterTops and is technically their player rewards program. While playing your favourite games, InterTops will keep track of your bets and for every $100 you place in bets, you will earn a yard. Players who are able to earn 100 yards will receive $10 instantly. You can earn $20 by completing a full 18 hole course. The casino provides an updated leaderboard on their website so you can keep track of your current standings, along with other casino players. Once you have completed a full course, the leaderboard will reflect these stats and you will work towards earning a $50 bonus by placing in the top 5 of the leaderboard each month. Players who choose to sign up and receive the signup bonus will need to clear it before you can request a withdrawal. Players will have two weeks to clear their bonus before it expires and will be required to roll the bonus and initial deposit amount over 30 x before requesting a withdrawal. Slots, American Roulette and Keno will count towards 100% of the wagering requirements whereas; Table Games and the other versions of Roulette will only count towards 50% of the wagering requirements. 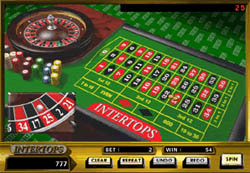 Players who choose to claim the mobile bonuses will only be able to clear them when playing on the InterTops mobile casino.